*Continental air prevails all over the country and is likely to prevail during the next few days. *No western disturbance approaching Northern Pakistan during the next few days. *Heat wave to grip almost all Pakistan during this week. *Expected storm in the Arabian sea not likely to threaten Pakistan. The heat wave – More load shedding! Karachi to see 36°C – 38 °C all this week. Lahore to sizzle at 47 °C on June 8. Islamabad to witness 42 °C on June 10. Peshawar to see 41 °C on June 9. Multan to sizzle at 48 °C on June 7. Nawabshah to sizzle at 49 °C on June 6. Larkana could see 50 °C on June 7. Tropical depression ARB 01 – Gaining strength now! A week ago, the Upper Air Cyclonic circulations were forecasted to form intensify into a cyclone or a tropical depression on June 2 and move towards Gujarat and adjoining Sindh coast but that was delayed. The new forecast is that a low pressure will form on June 4 or June 5. A low pressure is forecasted to either form on June 4 (tonight) or June 5 (morning), if that does not happen then chances will further reduce of a tropical depression formation, but latest forecast look good. According to BBC, the expected storm moves North west then west but later moves back to make landfall between Mumbai and Goa in India. It is worth mentioning that BBC is not changing this forecast since May 26. track similar to cyclone Phyan 2009. According to the GFS, the expected storm will move a towards the Maharashtra-Gujarat- coastal areas and from there it will start moving towards Oman. Other forecast is that, the storm will move towards Sindh-Gujarat coastline and then enter Rajasthan, a track followed by 1999 cyclone and 1998 cyclone and 1992 cyclone. Another is that, it will move from Sindh-Gujarat coast to Oman. Another, considering the sub-continent only is that the storm will hit Oman and then recurve to Balochistan but it will move towards south Punjab instead coastal Sindh as a remnant, somewhat similar path to cyclone Phet 2010. Possibility of Gonu-like track also persist. These tracks and intensity will keep on changing day by day even if a cyclone forms, as cyclones are hard to predict. But if it forms then the changes will be small. Oman – First Gonu, then Phet, now Keila?? Very heavy rainfall to extremely heavy rainfall likely in Oman especially the capital Muscat where more than 100 mm rainfall is likely with strong wind storms of 50 mph from June 9. Gwadar- memories of Phet or Gonu?? Heavy rainfall likely in the sea port city of Balochistan, Pakistan. Rain could reach above 70 mm with winds up to 45 mph or greater from June 9. No major rainfall likely in Karachi as storm will be far away from Sindh. But moderate showers with fast to strong winds could occur due to the developement of some thunderstorms near Sindh due to the tropical depression from June 7. These all are forecast as of June 4, could change in the days to come. If the storm threatens Pakistanis coastline especially Sindh then Pakistan Weather Portal (PWP) will give updates, breaking news and news alert. Monsoon has further advanced into many parts of India. Under its influence some very heavy isolated heavy rainfalls are lashing India including Kerala. Bombay is all set for monsoon as pre-monsoon showers has been lashing the city since the last few days. During the next 2 to 3 days, monsoon will force its entering into Mumbai and the monsoon rains will begin, indicating an early arrival this year. 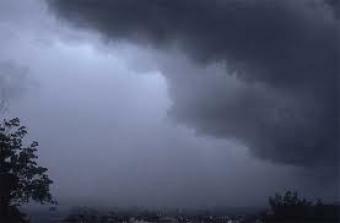 The cities of Pune and Mumbai are expected to be covered by the monsoon in the next 48 to 72 hours. Some southern parts of Gujarat are also expected to be got monsoon rainfall from June 6. Gujarat did see pre-monsoon rainfall on June 3, when the capital Ahmedabad was lashed by scattered showers of 14 mm that flooded some areas of the city, Jamnagar, coastal city of Gujarat also saw its first pre-monsoon showers on that day. No pre-monsoon rainfall activity likely in any part of Pakistan during many days of June. But one or two showers could occur in parts of south-eastern Sindh inlcluding Badin, Mirpur Khas, Umerkot, Thatta and Karachi if the expected low pressure moves to a little towards southern Gujarat. Heavy rainfall is likely in western coastal Balochistan but it is not a monsoon region. Pakistan Weather Portal (PWP) wants to know what do you think now. Formation of a tropical depression in the Arabian sea during the next 24 hours is fair. The system has started moving north west wards, sea temperatures are high and wind shear is very low. As of now a strong weather system is near Mumbai. The Indian Meteorological Department has updated the system to a low pressure. During the next 24 hours the low pressure could intensify into a well marked low pressure then a depression. The low pressure that was gaining strength in the Arabian sea on June 6 has now weakened on June 7, its sea level pressure has increased from 1003 MB to 1006 MB. Though sea temperatures (29°C to 30°C) are highly favourable for a developement of a depression. But during the next 24 hours, either the low pressure will dissipate or it will gain strength again to become more well-marked and then further intensification will take place. The storm has also moved WNW than yesterday’s NW direction. (Update 5:00 PM PST JUNE 7) – follow the new article! In the continuation of Update 4 pm, the low pressure has intensified into a well-marked low pressure again. In next 24 hours to 48 hours, it may reach depression status. The low pressure could also reach deep depression to cyclonic storm “Keila” status on June 9 to June 10. Government advises all the fishermen of Balochistan and Sindh especially of Sindh to return to land before June 10. As per latest forecast, the GFS and BBC predict a depression in the Arabian sea. GFS shows a strong cyclone will pass through Pakistan coastal areas to Iran as a weak depression. 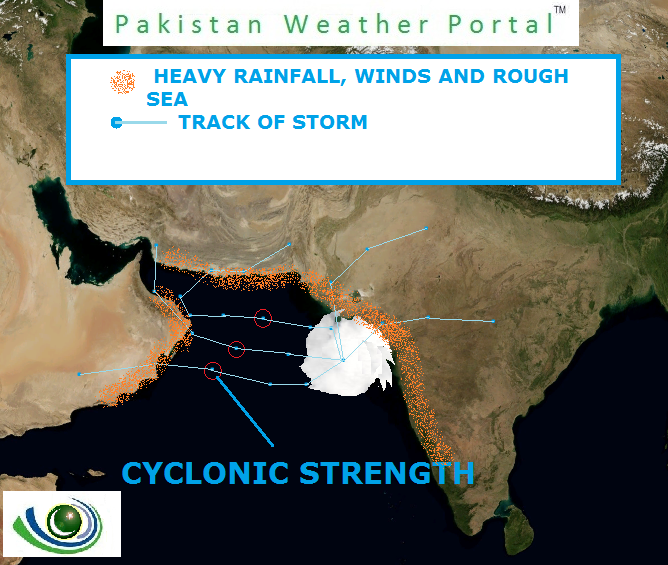 Under this influence, heavy to very heavy rainfall with stormy winds likely all over the coast especially Sindh coast from June 10 to June 13. These all are forecast could change in matter of minutes. PWP will start the Special coverage of cyclone Keila, if a depression forms on any day. ← Pakistan Weather Portal (PWP) – May in review! How is fast the wind storm?? Where is the exactly situation now?? please tell that what i the latest news now?? how many percent chances are there that there will be rain in karachi?? One more thing, are there still any chances that the system will be dissipated before striking any where? read “Update 5 PM” on the article is latest ..and not changing..tonight or tomorrow..more info..as per latest forecast the system will be at its peak intensity near Sindh..and start losing while going to Balochitsan..will reach Iran as low pressure..these forecast could change..
which is category estimated now?? as per latest forecast…not likely to attain category 1 or greater…it shall intensify from depression to deep depression to tropical storm Keila (cyclonic storm keila)…as i said eariler this could change…weather is some thing that is very hard to predict 100%…we can only predict 85%… no technology is there is the world that gives 100% correct forecast..
karachi guys need very very n very heavy rain,karachi metro is there any chance of that????? Is the monsoon coming from Africa have an impact on the storm? And how? we are planning for a trip to hawks bay on thursday 9th of june.Can the trip be regarded as safe on thursday or shall we postpone the plans for later days to come. The system, which has formed in Arabian Sea, can this be intensified into A Category Cyclone? If Yes, can it re-curve to Karachi? Your replies are really helpful. it can curve to karachi and within 2 days its intensity increses. where u see these current models? From where did u saw such prediction ?? can u give us the link ? I think the storm is moving to Oman, or what? what’s the latest? is it true that it is targeting Iran right now and not Oman? what’s the current classification? low pressure or well marked low pressure? @ bmw from where u know this? karachi Metro, any latest updates ???? the system is gaining strength….its NOT moving towards Oman…. so is it moving towards Karachi ?? Possibility Of same track as karachimetro notified.. Seems like system is intensifying and can get worst. I think it’s becoming weak and could dissipate. No…it is gaining strength BUT slowly…any one would be a naive ..if he says that these are rumours…its all ready a well-marked low…thats a storm! !..the JTWC is monitoring the storm, IMD, PMD…all pakistani media has eye on this storm..that can be seen through satellite as well…THESE ARE NO RUMOURS!! So what is this?? Is the system dissipating now? I think tonight it will take a proper shape with eye. next 24 to 36 hours is very important for cyclone..
dont rely on the predictiobs of bbc,yesterday bbc was showing thundery showers in khi,but u had seen the weather today. I think we must pray for some good showers, Karachi Metro could you please tell us that when rain is expected in Karachi is it expected on Friday or Saturday ?? ?